"Incy Wincy spider climbed up the water spout..."
I've been singing this rhyme to Little Dude since he was a baby, and he always loved it! You may also have heard this rhyme as Itsy Bitsy Spider. Either way, it's a fun and simple rhyme that kids pick up quite easily. 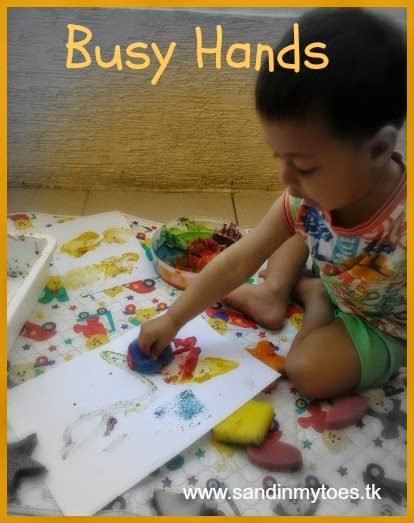 The following craft is really simple to make, and a fun activity for toddlers and preschoolers to sing the rhyme while playing it out. Remember these bottle top spiders we made? 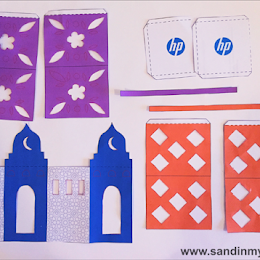 Read the instructions on making them here. 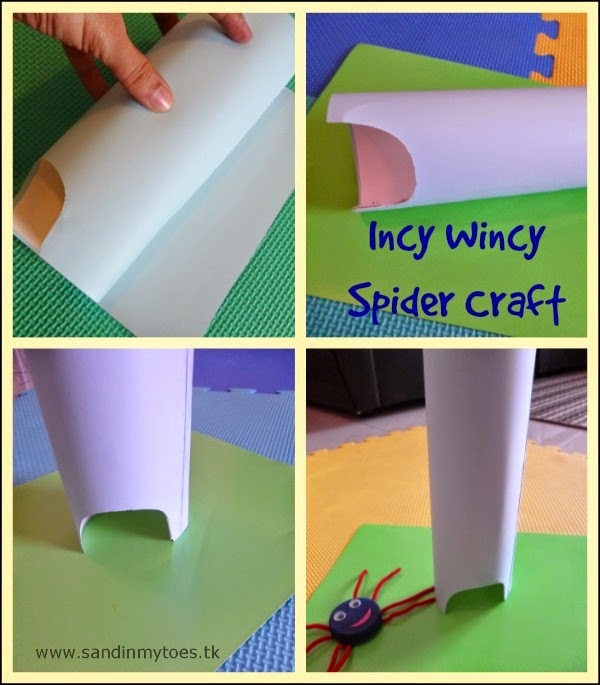 We used these spiders for our Incy Wincy Spider activity. All we needed to make was the spout! For the spout, I rolled up a white card, and covered it in blue paper. You can also paint it, but I found this much easier and faster to do. Cut out an opening for the spout at the bottom. Stick it on to another card (I used a green one) using glue or clear tape. 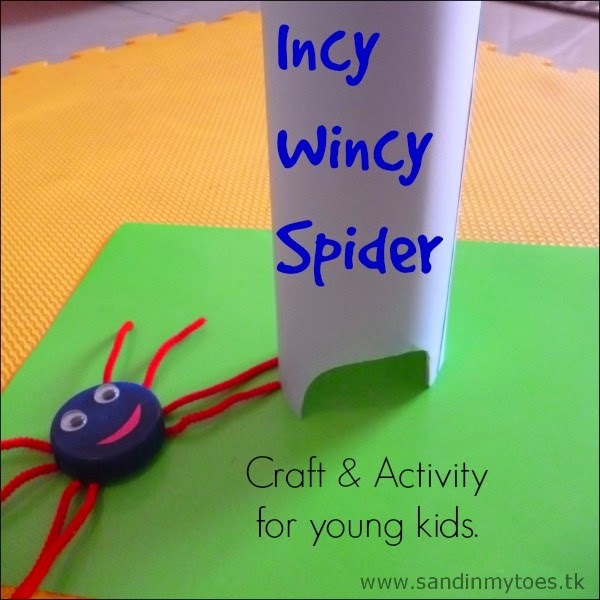 And your Incy Wincy craft is ready to play with! Little Dude sang the rhyme and made the spider go in the spout and out. I think he had the most fun in the 'washed the spider out' bit when the just made the spider fall down the spout! When making the spout, remember to keep it wide enough for the spider to go in and out easily, or it will get stuck. 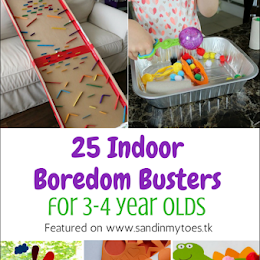 Looking for other ways to teach through play? Check out my posts on Number Hunt, Storytelling Props, Fruit Sticky Puzzle, and Alphabet Matching Activity. Lovely idea and so sweet. What a lovely activity. it looks like he's having fun with it. love this idea, will be doing this with my son! Hope you try it out, then, I'm sure he'll love it! That's why we made them cute, Mike! Thank you Catherine, this is our first nursery rhyme craft! I like simple crafts too! I hope they have fun with it! That's a creative thing to do! Hope he has fun with it! I love this! 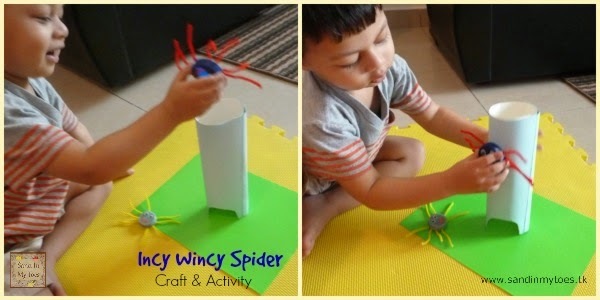 One of my 3yo's favorite song is the Incy Wincy Spider. Totally making this! Bottle tops are really fun to work with! My son is going to love this so so much! Thank you!